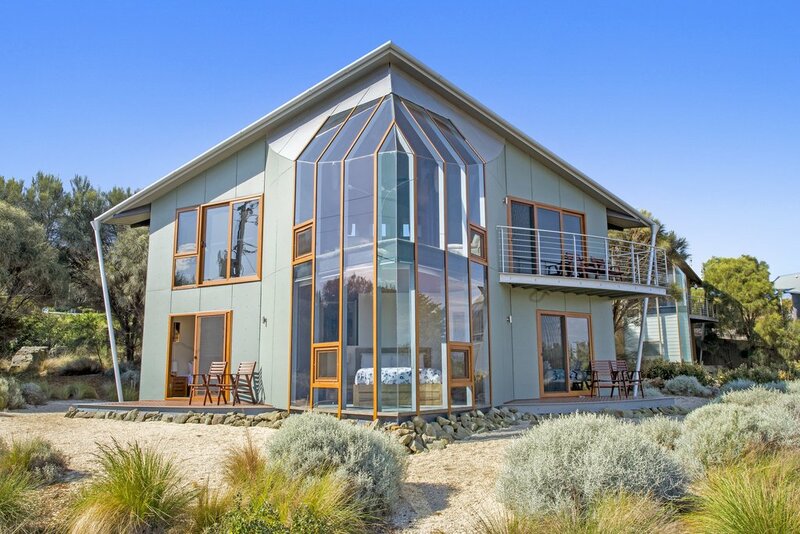 Manta Ray One is a landmark property with magnificent beach views and access. 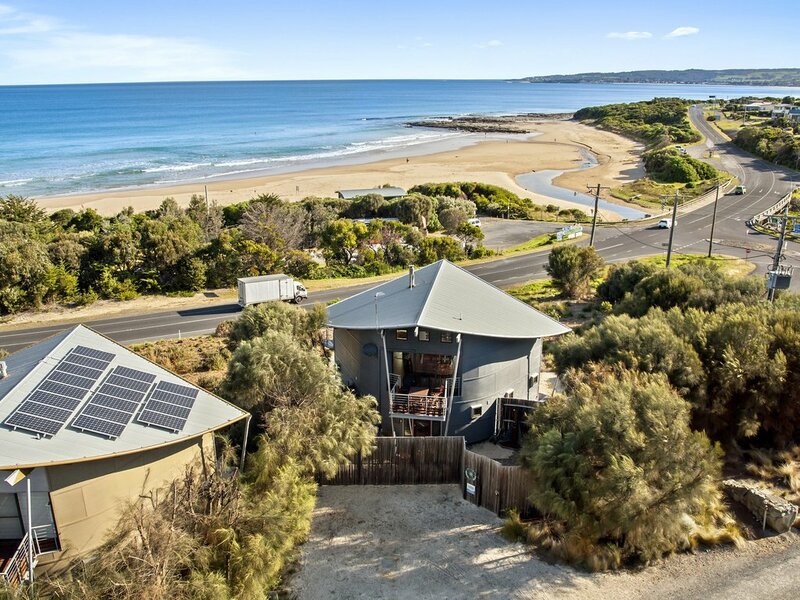 The location of this property is fantastic – straight across the road from the beach. 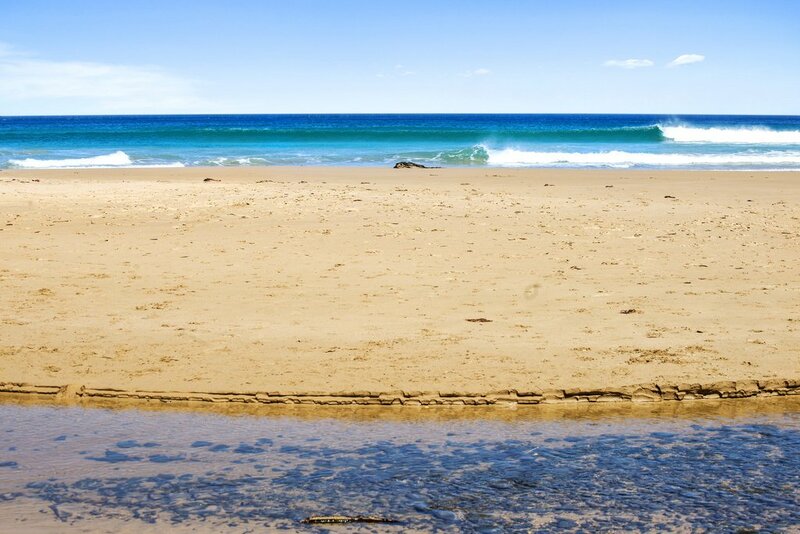 Enjoy your morning coffee while you check the surf. 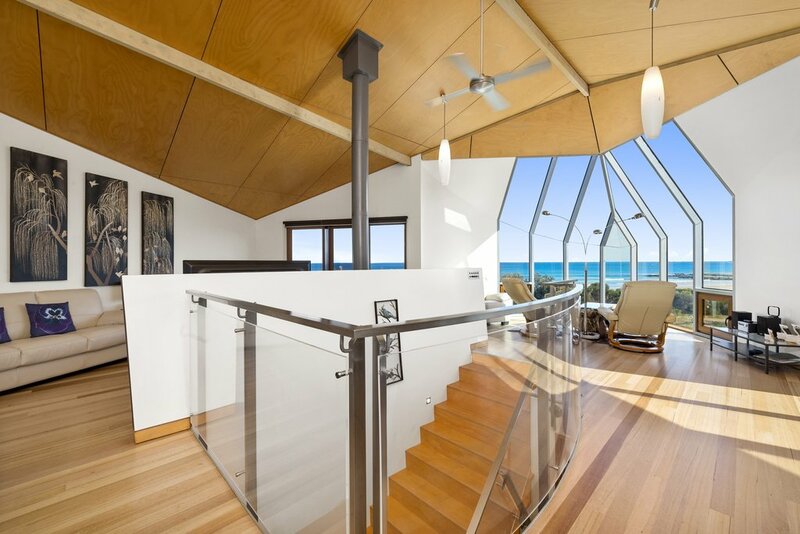 The Manta Ray One beach house feels at home in the seaside setting. 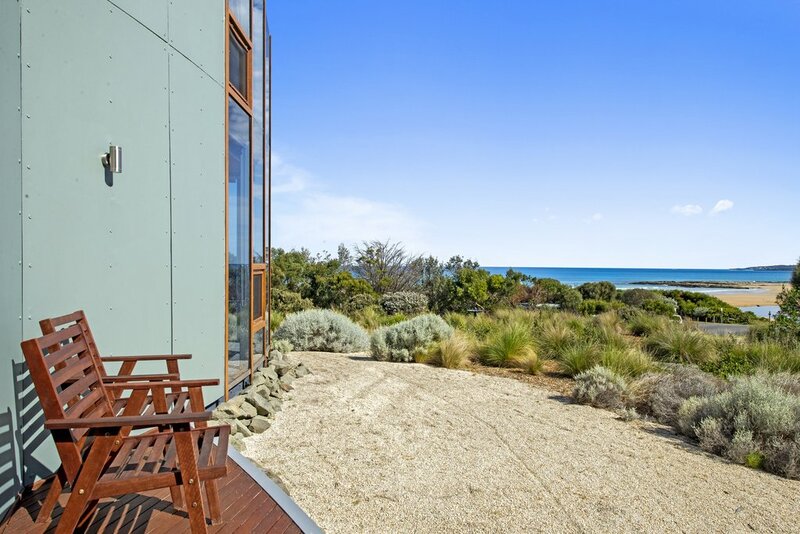 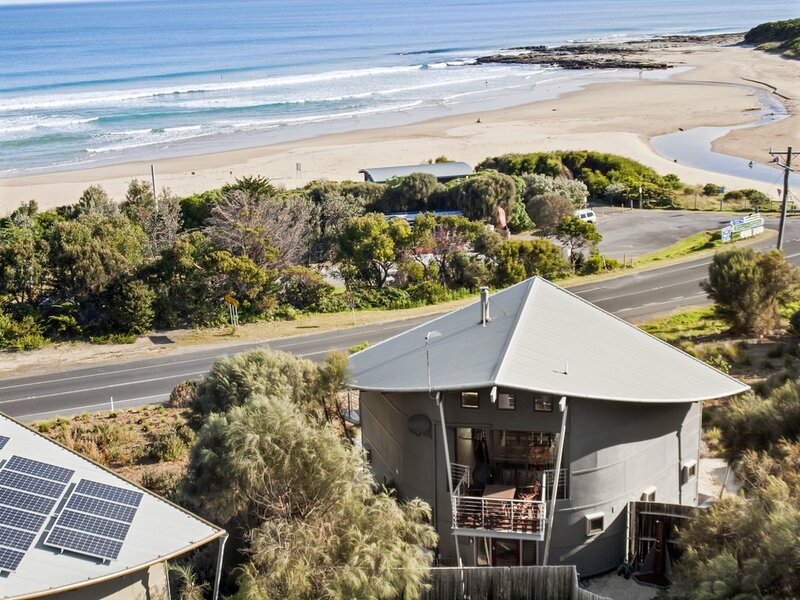 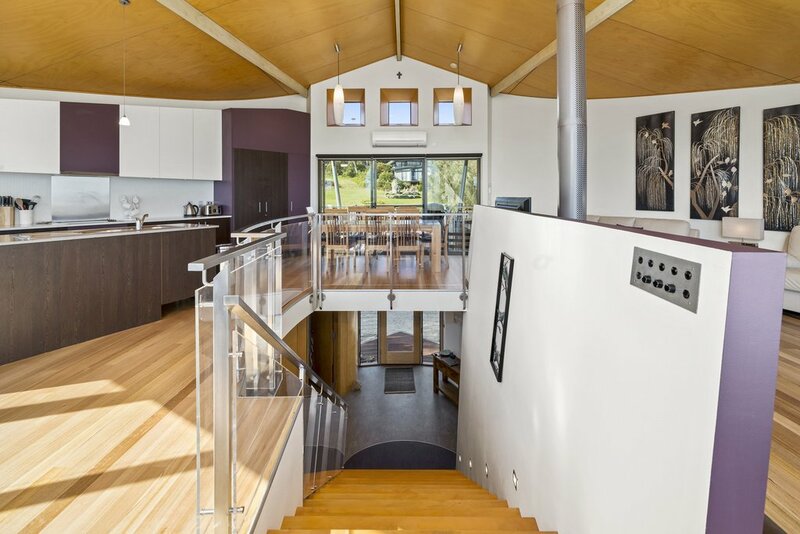 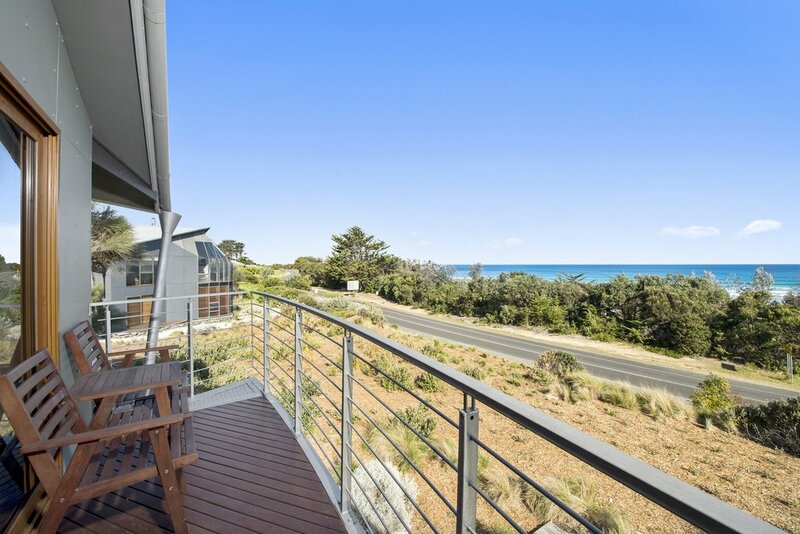 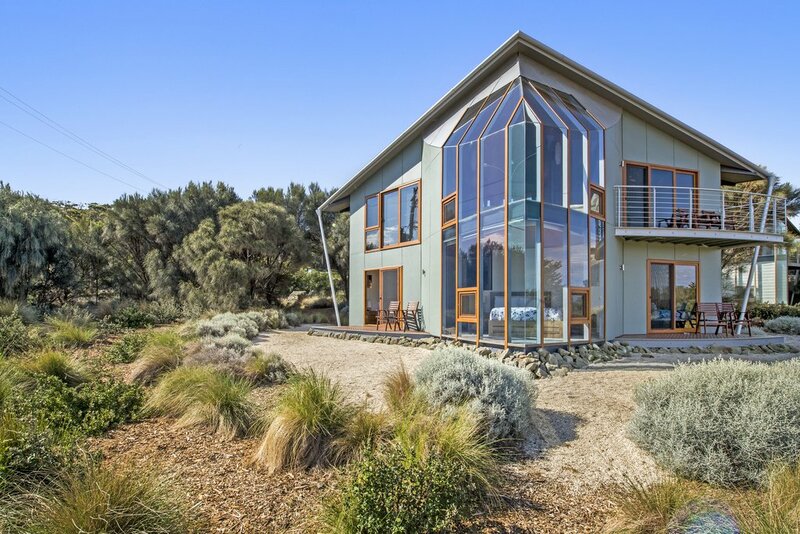 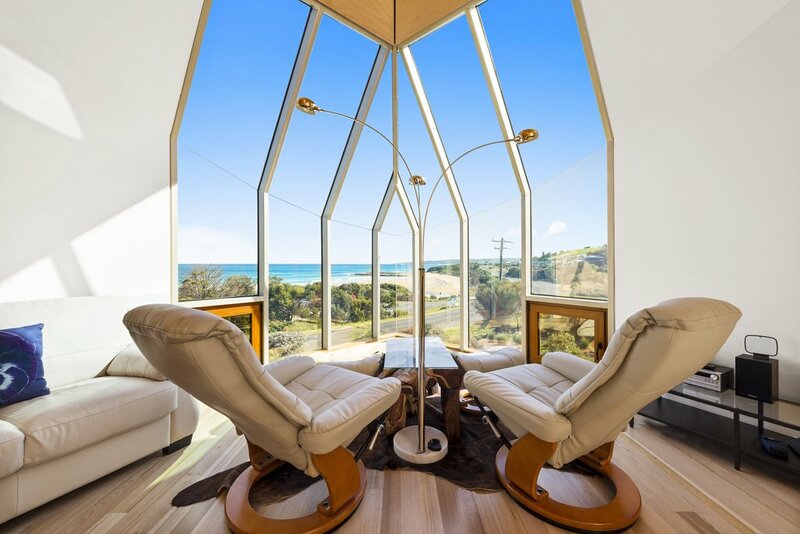 The subtle sting-ray like design nestles into the landscape while looking out over Skenes Creek beach and the emerald hills of Apollo Bay. 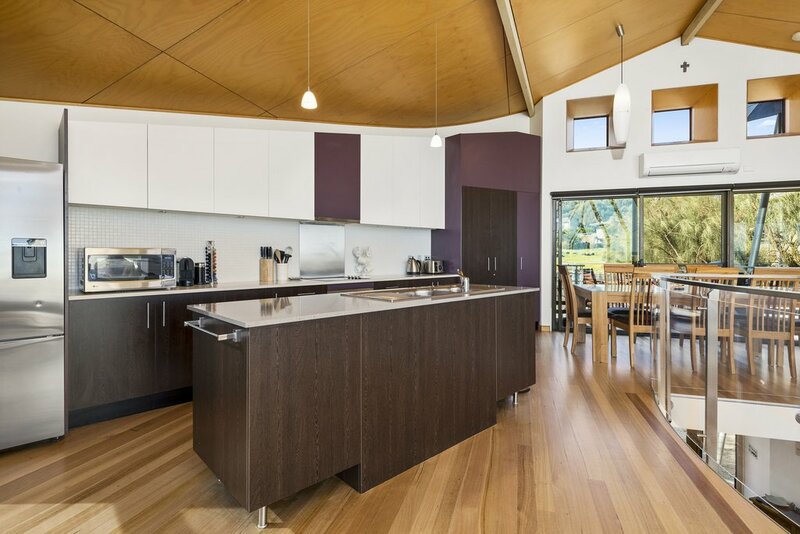 Built over two levels in an open plan living style, this property has a truly cutting edge design. 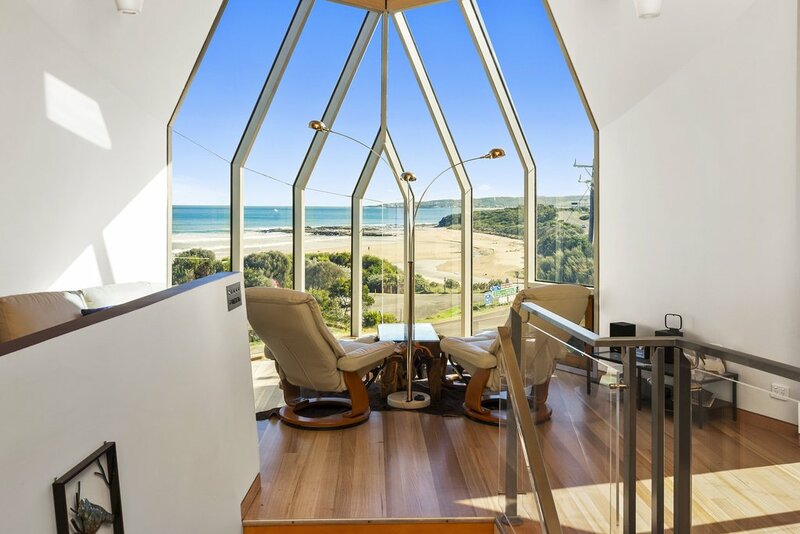 The first floor living zone captures an ever changing 180 degree view of the sea, the rolling hillside, and the Great Ocean Road as it winds along to Apollo Bay. 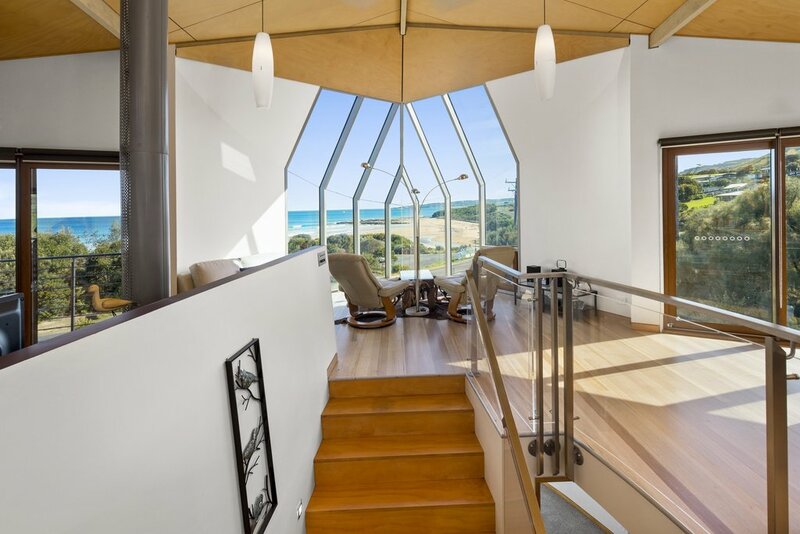 This open plan level features an angled glass atrium, where you can bathe in the sunlight as you look out on the waves and beach. 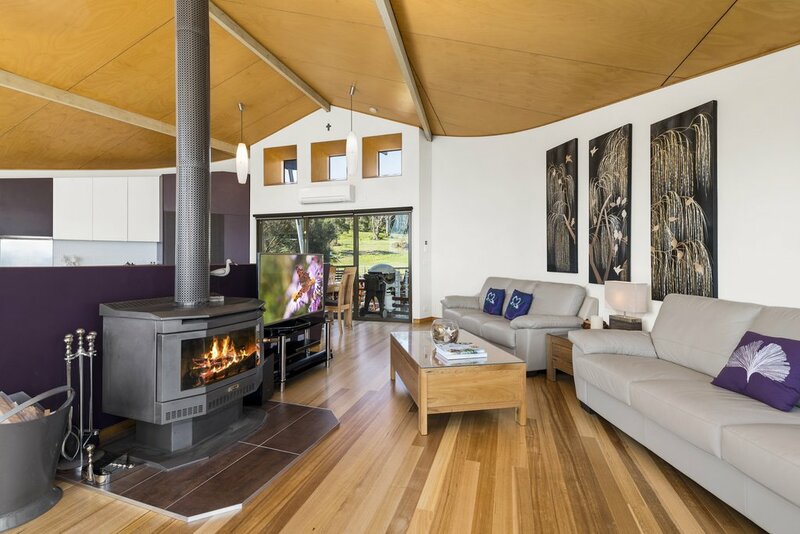 There is also a lounge area with wood fire, leather couches, and large TV as well as a fully equipped kitchen and dining area. 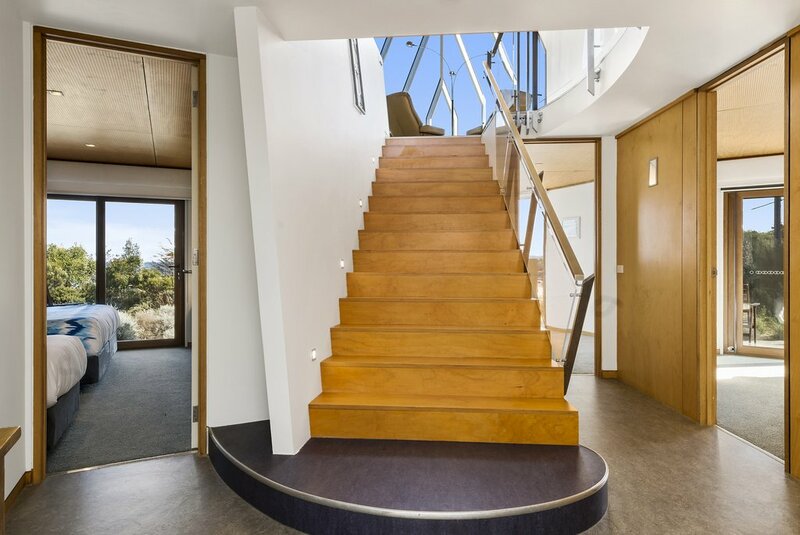 The lofty ceilings and polished floors bounce the light and compliment the design. 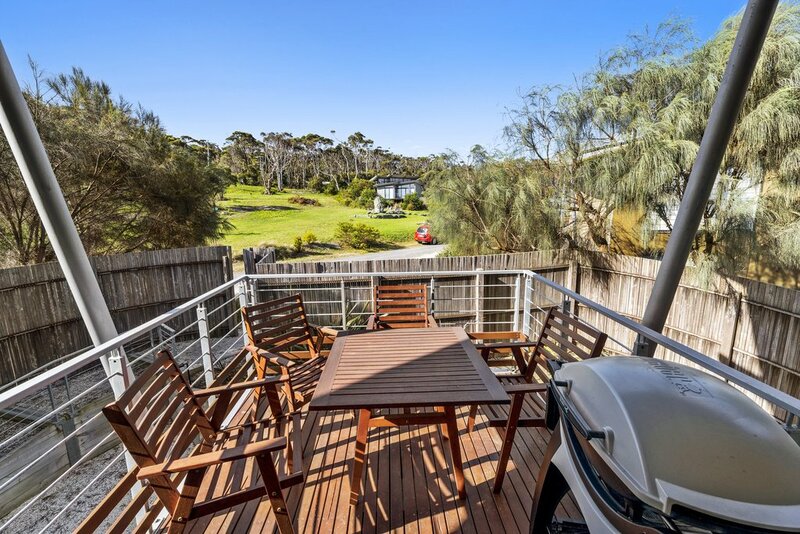 There are two decks – one on the ocean side of the house, and one on the Northern side with a BBQ and outdoor furniture. 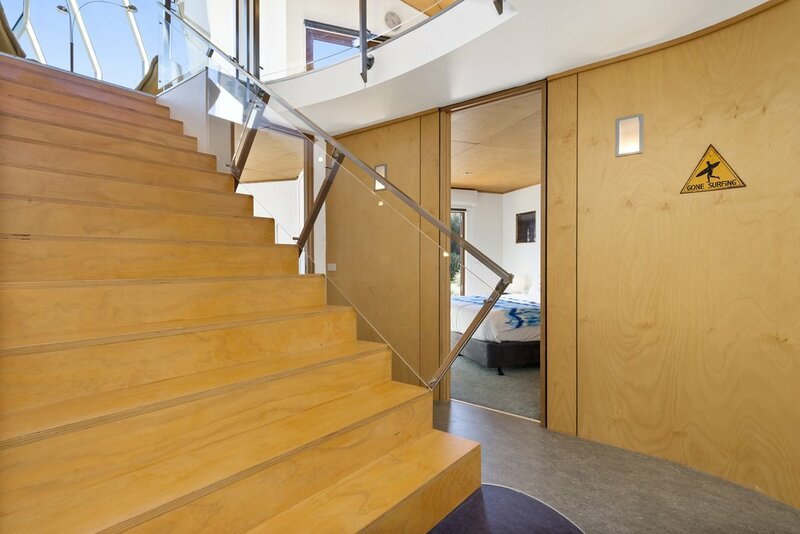 The ground level has 3 bedrooms and 2 bathrooms, including an ensuite to the master bedroom. 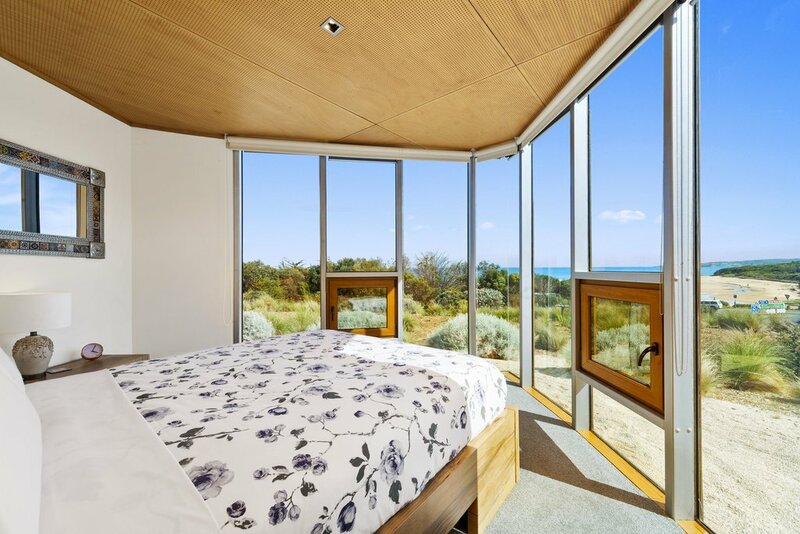 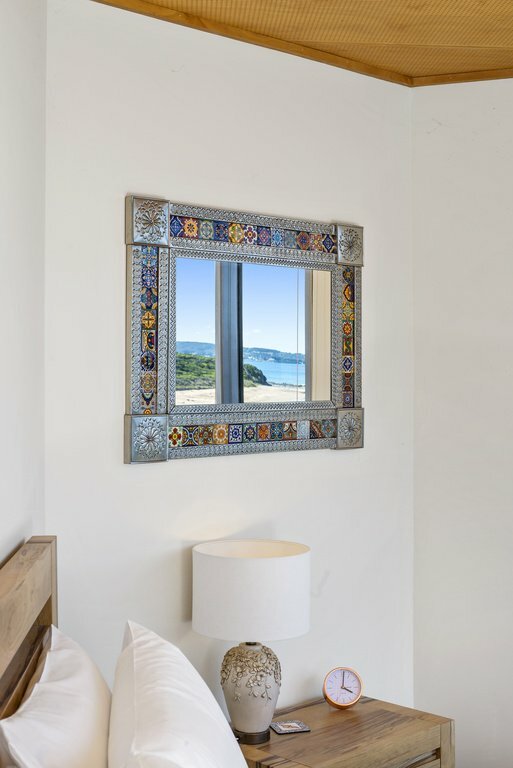 Each bedroom has a different slice of the view through full length windows. 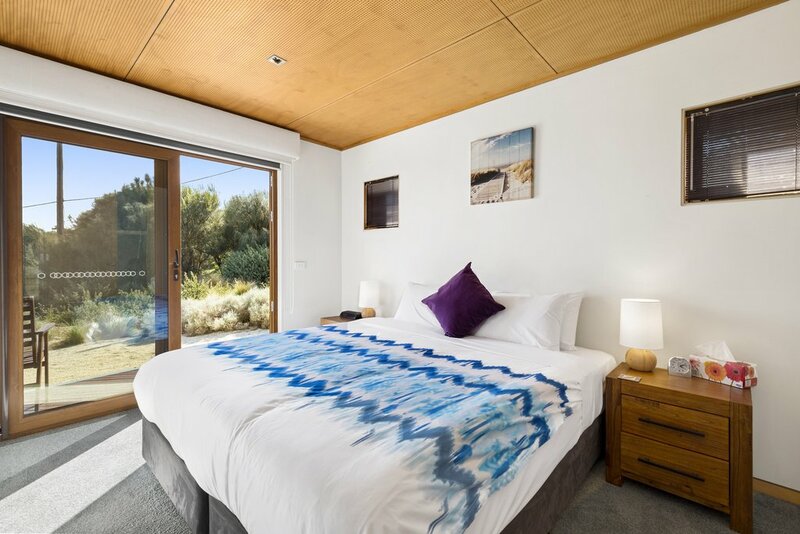 Two of the bedrooms have sliding doors opening onto private decks and the native garden. 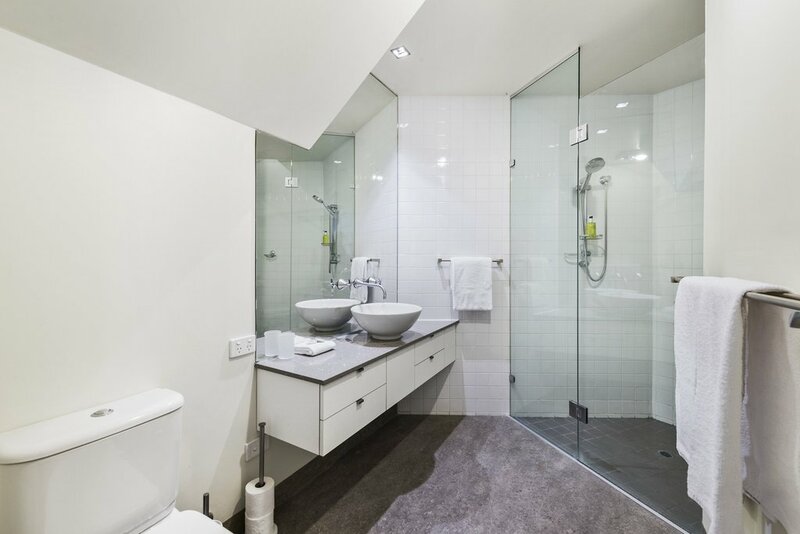 The ground level also has a fully equipped laundry. 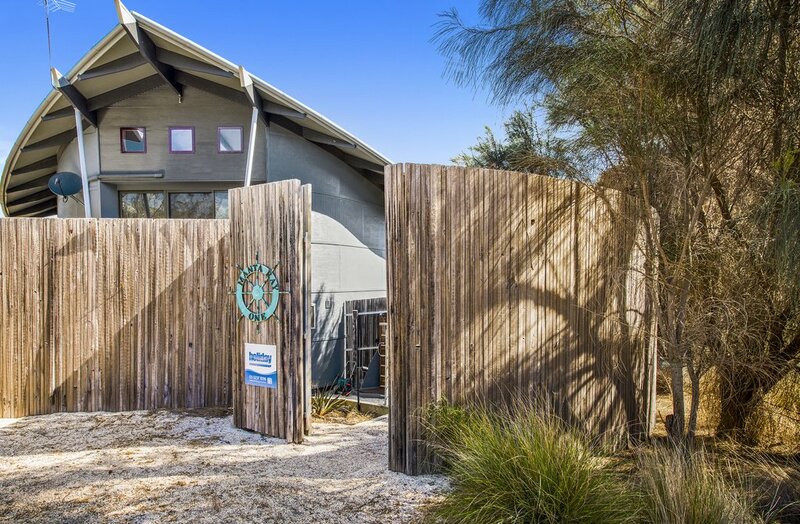 Manta Ray One is pet friendly and has a fully fenced yard and a kennel. 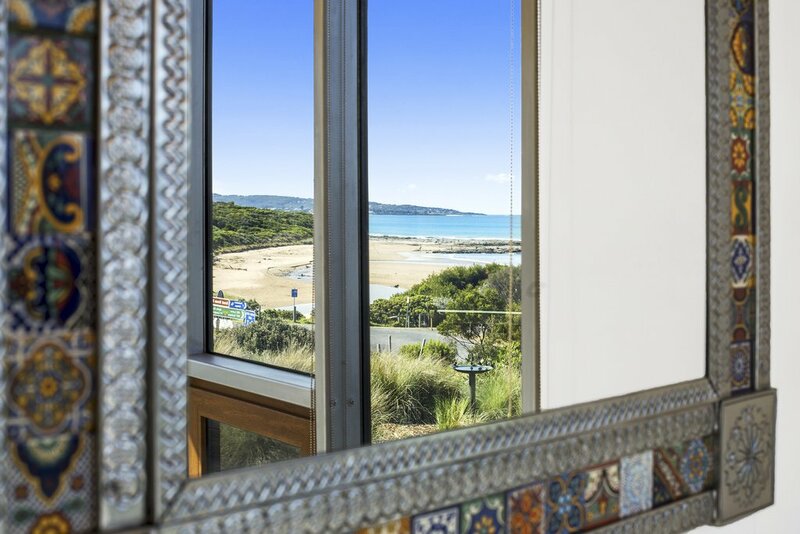 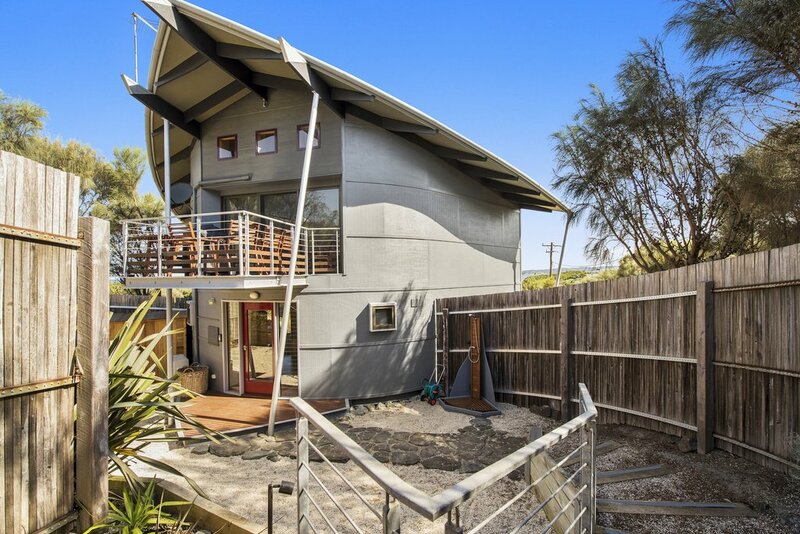 There is heaps of space for surf boards, body boards and beach gear in this fenced courtyard, along with an outdoor shower to wash off your sandy feet. 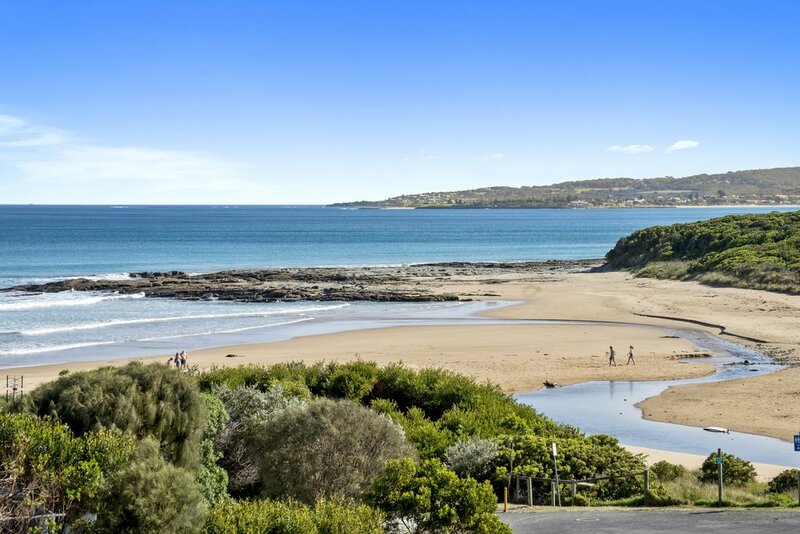 The Skenes Creek beach is great for families, surfing, fishing, beach combing and simply walking along. 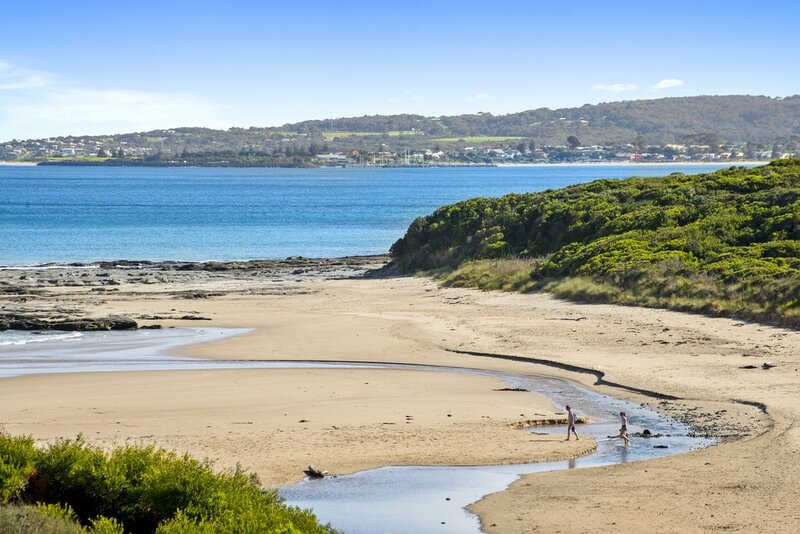 At low tide, you can walk all along the beach from Skenes Creek to Apollo Bay. 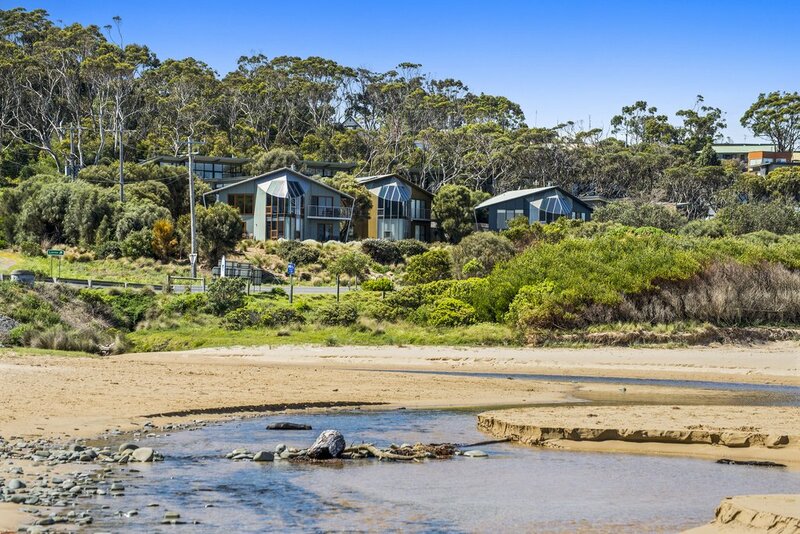 There is off street parking and room to park a boat or trailer. 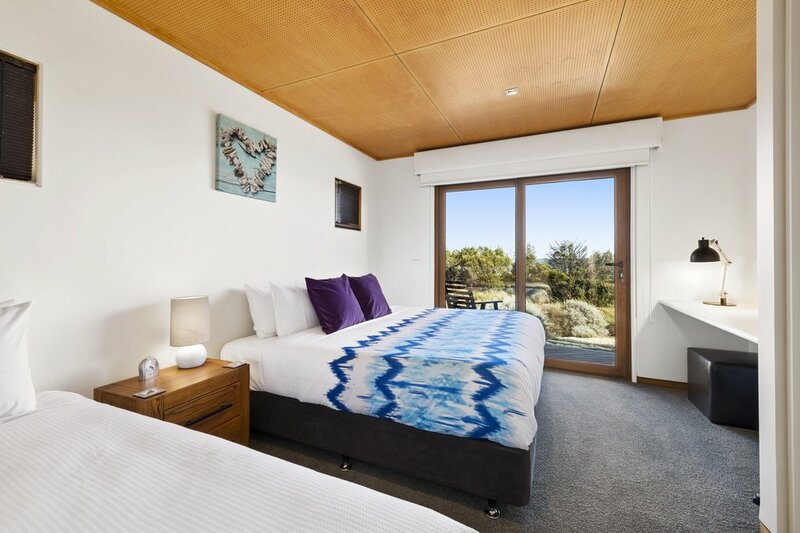 Manta Ray One can sleep up to 7 people in 3 Bedrooms. 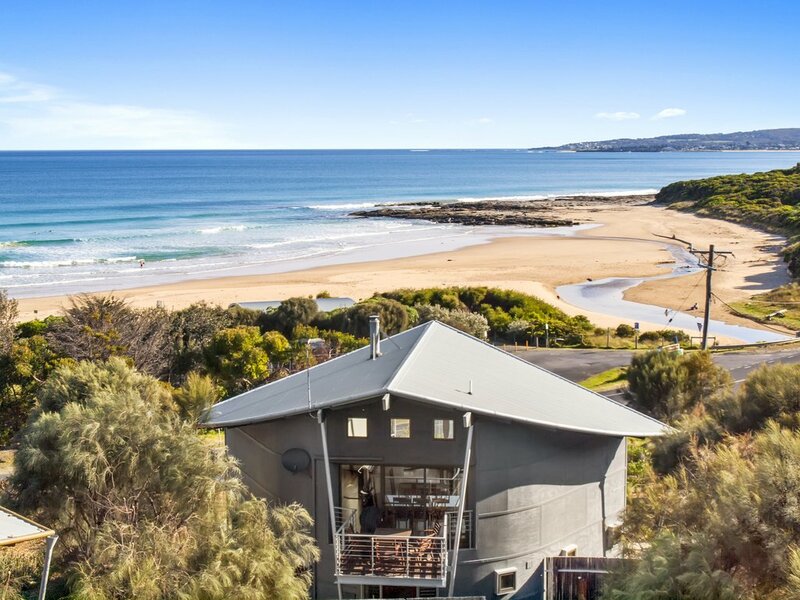 A perfect place for a romantic weekend, and equally suitable for a family holiday.